The university was recently named the grand prize winner in the National Association of College & University Food Services' 2015 Sustainability Awards competition, which honors colleges and universities that have demonstrated outstanding leadership in the promotion and implementation of sustainability specifically in dining services. Upon arrival this semester, students received a reusable to-go container made from sugar cane that can be used in three dining centers. 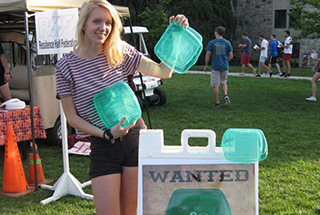 The distribution of reusable containers is an effort to reduce the usage of disposables and the amount of waste generated on campus. Aligned with the university's participation in the Real Food Challenge, the campus community can now purchase locally grown produce at a weekly farmers market. 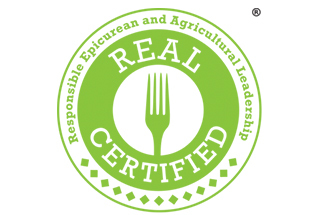 The United States Healthful Food Council recently announced that Stanford has become the nation's first campus dining program to obtain the Responsible Epicurean and Agricultural Leadership (REAL) certification. Honored for its commitment to holistic nutrition and environmental stewardship, the university was evaluated on whole-foods use, portions, behavioral components and procurement. First university in the Big Ten to sign a campus commitment to increase the percentage of "real food", the commitment calls for 20 percent of the university's dining hall food to meet the Real Food Challenge's definition of real food, defined as ecologically sound, community-based, humanely produced or fair trade. University Dining partners with local farmers and producers to deliver that fresh, home-grown experience to a campus with more than 30,000 students and 14,000 employees. As the university and Aramark forged a 15-year, $245 million partnership last year to transform dining services, the opportunity to support Kentucky farmers and processors expanded. On a weekly basis, students take leftover prepared food from a university dining facility and a marketplace to food pantries across the county in an effort to address food insecurity issues. (U.S.): In an attempt to improve waste reduction, recycling and composting, the university removed the straws, which are hard to spot when conducting post-consumer, dish room garbage separation. (U.S.): Haddock, pollock and cod at certain on-campus dining locations are now Marine Stewardship Council (MSC) Chain of Custody certified, which ensures that the seafood can be traced back to a fishery that has been certified as sustainable and well-managed against the global, science-based MSC standard. Under the new amendment developed by the Campus Sustainability Office and the university's food services provider, Aramark, PSU Dining will increase total local and third-party certified food expenditures each by 5 percent annually, based on purchases made in 2014. The new student-operated, cooperative cafe serving local, organic, budget-friendly and vegetarian food was birthed from a group of environmental studies students in their senior research seminar. The newly released video spotlights the university's food truck that serves food from campus' farm, which hosts students to learn about farming. Thanks to members of the campus community, the recently signed commitment means that University Dining Services will spend at least 20 percent of their total food purchases on real food, defined as local, nutritional, ecologically sound, humane and/or fair, by 2020, nearly doubling its current level. In an effort to raise awareness of the impact from sushi's high demand, the university's Sustainability Office organized the reduced waste event in which students made their own sushi rolls, and learned about where the food came from and its ranking in the Monterey Bay Aquarium Seafood Watch program. (U.S.): The university showcased its commitment to locally sourced foods through its participation in the inaugural Campus Crunch in which students, faculty and staff joined colleagues at 17 other schools and colleges across New York State to emphasize how universities can work with regional farms to promote sustainable food production. (U.S.): Shifting from self-service, the new dining service was recently introduced in an attempt to minimize uneaten food scraps being sent to the university's compost facility. Preliminary measurements indicate a reduction of leftover food on plates. Building on university Housing and Food's commitment to create a better food system, Students Against a Factory-Farming Economy sought signatures for the Real Food Campus Commitment, which asks for a university pledge to make 20 percent of all food sold on campus Real Food-certified by 2020. The new locally-owned mobile farmers market, offering fresh and local fruit, vegetables, meat and baked goods, is a partnership between the university's Dining Services and a local business. (U.S.): Through new food purchasing standards, local farmers can now sell produce to the university that was grown without pesticides, herbicides, and genetically modified organisms (GMOs). By purchasing local produce to serve to students, the university saves money and reduces carbon emissions. (Canada): The university recently opened a zero waste food court by increasing composting efforts and purchasing locally sourced food. Students can now expect more sustainable food options in the cafeteria thanks to a new partnership between the university and Local Inland Northwest Cooperative Growers. This partnership will contribute toward the Real Food Challenge pledge to source 25 percent of food from local providers by 2020. Kathleen Hunt, dining services sustainability coordinator and doctoral student, won the 2014 Green Champion Student Award for outstanding leadership, participation and promotion of sustainable effort in dining by the National Association of College and University Food Services (NACUFS). 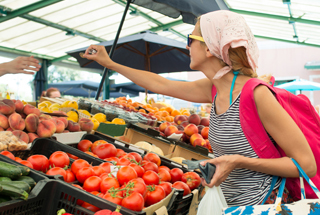 Instead of using the Real Food Calculator to evaluate recent purchasing, the college recently decided to incorporate the criteria of the national food evaluation system into its menu management database in order to have access to real-time reports about how much sustainable food purchases are being made, and thus, begin a conversation about different ways of measuring sustainable food. Furthering its commitment to source more local food, staff started the garden to research ways to minimize water use while maximizing yield. The garden, which is based on organic gardening principles, has improved staff engagement and appreciation of food, which helps reduces food waste. (U.S.): Students from the university's social work discipline recently began fighting hunger in the surrounding community by delivering surplus food to a community meal program. The inaugural Sustainnovation celebration is an upcoming day-long series of events designed to highlight changes in food in Colorado Springs and on campus. Real Food Challenge recently announced that 134 universities and colleges are now using the student-designed calculator to measure and report local, fair, ecologically-sound and humane food in campus dining. The recent $50,000 grant from the Henry P. Kendall Foundation will support the university's Local Food Challenge, which will draw from the campus farm, the on-campus food management company's 40 farm shares, and will work to create collaborations with food suppliers within a 150-mile radius. In an effort to expand the university's Montana-Made program, University Food Services has hired a full-time staff member to grow relationships with current and potential vendors, gather baseline data, and create viable goals. Attempting to help students do well in school, the university's Dean of Students Office and local food bank are teaming up to provide students with healthy food on a regular basis. (United States): The Sodexo Foundation's Campus Kitchen Project video competition awarded the five universities funding for a Campus Kitchen, a student-operated kitchen that recovers quality food going to waste to provide nutritious meals for those in the community that are struggling with food insecurity. The winning universities are Indiana University-Purdue University Indianapolis, Southern Illinois University at Edwardsville, St. Peter's University, Georgia Tech and University of Wisconsin at Green Bay. (United States): Increasing the amount of local and sustainably-grown food, the university's Dining Halls are now serving lettuce that was grown without the use of chemical fertilizers, but instead fertilized by fish waste in a practice known as aquaponics. In an effort to promote health and environmental benefits, the university's new initiative offers more vegan and vegetarian options. The university recently achieved the MSC Chain of Custody third party certification, which supports sustainably-managed fisheries also certified by MSC standards. Five residential dining halls will offer seafood designated as MSC-certified. After receiving grant funds, the university's Dining Services program recently implemented the labeling system to indicate more healthful foods per U.S. Department of Agriculture guidelines. The system also labels more than 800 grab-and-go items with nutrition and allergen information. In an effort to procure more affordable locally-grown food, Yale University, Brown University, Connecticut College, Cornell University, Dartmouth College, Princeton University, Rhode Island School of Design, Tufts University, University of Massachusetts at Amherst and University of New Hampshire gathered at Yale to discuss ways to take advantage of economies of scale in local food procurement. The university's Gander Dining Hall was recently recognized by Green Dining Alliance of St. Louis for incorporating sustainable restaurant management and operational norms in the areas of recycling and waste reduction, awareness and education, sourcing and procurement, water conservation, energy conservation and efficiency, chemicals, and innovation. The university's new food service provider, Bon Appetit, is now procuring 100 percent of produce grown at the student-run campus garden. Called the food loop, students have coordinated with Dining Services for the food scraps to be collected for compost that is reapplied on the garden fields. After a recent class focused on world food production, a student initiates the Sustainable Food Market, a partnership with community partner, Fiddleheads Co-operative, to provide the campus community with fresh, organic and local foods every Friday. Johns Hopkins University; University of Massachusetts, Amherst; and University of Montana, Missoula pledged to buy at least 20 percent real food annually by 2020. Johns Hopkins University pledged to source 35 percent. 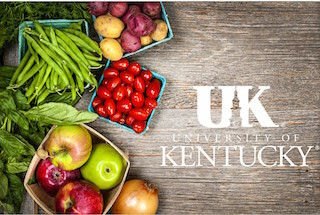 The university's recent decision to join the Kentucky Proud initiative will bolster its efforts to procure and serve food grown and processed within Kentucky. The yet-to-be-opened store will offer organic fruits and vegetables, freshly prepared food, fish and humanely raised meat that are harvested, prepared and sold by Berea students as part of their jobs with the college. The goods will come from the college's on-campus farm. The university's Dining Services recently partnered with The Wide Net Project to contribute to restoration of the Chesapeake Bay's health and provide nutritious food to vulnerable communities. After a recent student project proposal indicated the desire for reusable to-go containers, the university's Dining Services/ARAMARK has implemented the reusable containers system to decrease waste sent to landfills. In celebration of Eat Local Challenge Day, the university's Dining Services and several local vendors provided meals made entirely from local ingredients harvested within 150 miles of the university. In support of the university's sustainability goals, new dining options at Cox Hall include procurement of locally-sourced food and support of smaller, independent businesses. (U.S.): Featured in a new Farm-to-Fork Market Dinner event through the college's Culinary Arts department will be a five-course meal with nearly 100 percent of the ingredients from within 250 miles. In an effort to increase local food offerings, every ingredient used at the university’s Main Street Grill comes from a farm within 200 miles of the Quebec campus. Building its inventory of fair trade products, the university now only sells Fair Trade Certified coffee at all non-franchise businesses. Three teas and one type of chocolate are also offered. Food Tank, a non-profit think tank that explores environmentally sustainable ways of alleviating hunger, obesity and poverty, has named the university's Healthy and Sustainable Food Program Director Barton Seaver as one of 11 chefs pioneering the movement toward sustainable food.